The background on the commendation is as follows: On 11 May 1970, the gold crew was ordered to go down to the Eastern Test Range off Florida and launched 4 Polaris A3 missiles. I was an MT3 (SS) at the time and was very involved in configuring the missiles for test firing. The way it evolved was that we went on patrol as usual in late March 1970, then returned to Rota , Spain in early May 1970. However, we were not allowed to leave the ship. A team from Special Projects came aboard and we, along with tender personnel, removed the war heads and installed test warheads plus telemetry gear. We went back to sea and sailed to the test range to await firing orders. Once we received the order to launch, everything went smoothly for the launch of the first 3 missiles. The last missile broke the surface and upon first stage ignition exploded in a fire ball. The Key was already taking evasive action so we were diving deep and putting on turns. We did not realize what happened until the surface observers were calling us on the underwater phone. The films of the exploding missile we saw back in port were quite impressive. Click here to see actual award certificate. I had just reported to Key blue crew as an MT3 non-qual. We relieved the gold crew as soon as they returned to port. 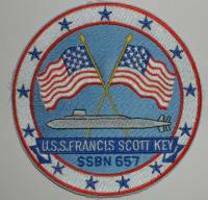 My first job on the Key was to be lowered down into the missile tube from which the missile that exploded was launched and scrub it clean from all the debris and mung caused by the launch. After spending 14 months in A and C schools learning all about the Polaris missile system, it was sure a surprise to be handed a scrub brush instead of an O-scope. Welcome to the real US Navy.